Bellatrix, I'm a Pug! : I'm one hot pug! Ugh do you see this?? It's almost 9pm and it's still 80 degrees out. It was over 100 degrees earlier today and tomorrow is looking too hot too. 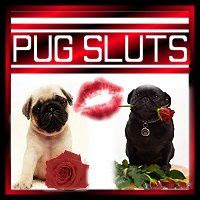 I feel so bad for my pug friends in the East Coast, they're getting all hot and bothered too....so how can we keep cool and not sweat? Have your 'rents blast you with their AC on full power it's so cold and as an added bonus, bite the air. Just make sure no one is watching you...you're a pug...you must stay dignified. 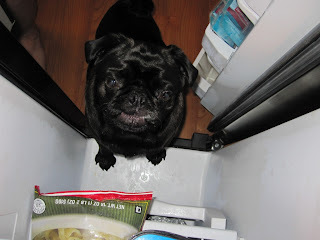 ....yummy pug ice cream! Now my new friends Jasper and Megan asked about my treats from a previous post and I feel bad that I didn't give you the 411 on this stuff. I love this stuff! It's what a pug needs to keep cool when it's scorching out! I totally orb'd my mom into getting these for me after my bath. Maybe you can orb your 'rent into getting you some too. Then again...if you don't feel like doing anything cause it's just too damn hot....then curl up with some AC and take a delicious nap. So what do you do to keep cool?? Us Slimmer pugs aren't really slim and those icy-creams look goods. Where did your mama get them? I sure hope it is a store we can find in Kansas. Thanks for the info on the ice cream. My Mom says she'll try to find us some! Hi Bellatrix. Here in Maine it's hot, but not as hot as the middle of the country, or even a couple states south of us. But, there is a fan in the living room and at night, I sleep on my mommy's bed and she has air conditioning! Also, lots of cool water and shade. I like the winter snow so much better! It has been HOT here in New Jersey. It was like 100 degrees for like 50 days in a row. Mom only lets us out for a very short time but when we do go out she turns the spinkler on and we chase the water. We like to come back into the air conditioned house when we're all soaking wet and shake, shake, shake and then take a nap! We can't go down on the beach because of all the stupid tourist and because the sand burns our paws. We are pretty used to the heat and have lots of tricks to stay cool. We feel terrible for all those folks who aren't used to have these scorchers! 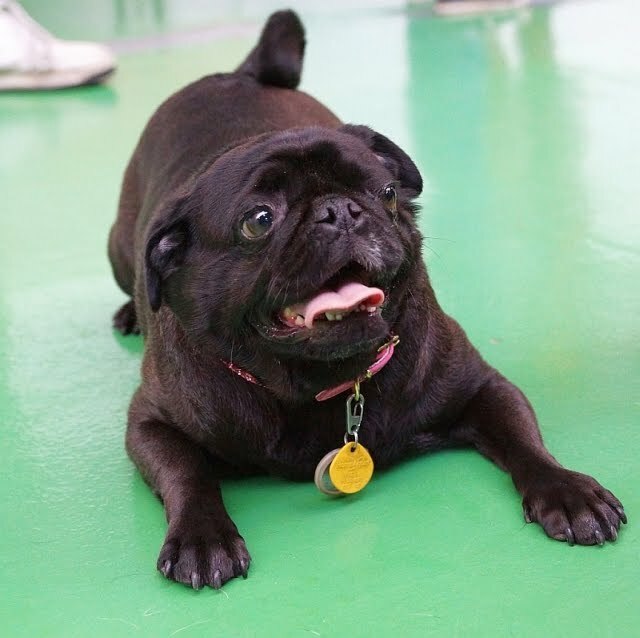 Thank Pug for air conditioning, swimming pools and Frosty Paws! OMD! I love, love, love, love the photo of you in the open freezer! You look really blissed-out with the nice cold chill going on you! Brrrrillient! Cindy Crawford wishes she was me!